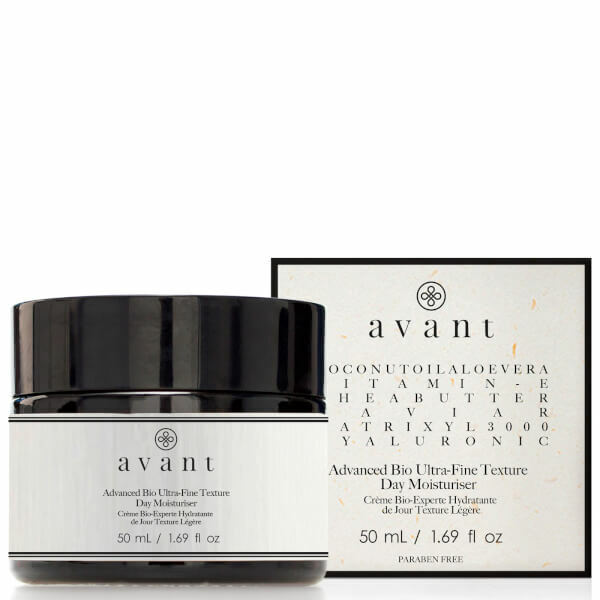 Replenish and rejuvenate with Avant Skincare Advanced Bio Ultra-Fine Texture Day Moisturiser; a lightweight, quick-absorbing formula that utilises natural ingredients and carefully selected science-based actives. Harnessing the powers of Hyaluronic Acid and innovative Matrixyl 3000, the luxurious day cream provides hydrating and anti-ageing properties to firm, plump and minimise the appearance of fine lines and wrinkles. Antioxidant-rich Caviar Extract helps to shield from pollution and environmental aggressors, whilst a nourishing blend of Coconut Oil and Aloe Vera soothe and strengthen for a smoother, younger-looking complexion with renewed radiance. Skin is repaired and revitalised with improved texture and tone. Matte finish. Aqua, Glycerin, Cetyl Alcohol, Glycerin (and) Butylene Glycol (and) Aqua (and) Carbomer (and) Polysorbate 20 (and) Palmitoyl-Pentapeptide 3, Glycery; Stearate, Butyrospermum Parkii (Shea) Butter, Stearic Acid, Cocos Nucifera (Coconut) Oil, Aloe Barbadensis Leaf Juice, Aqua (and) Potassium Sorbate (and) Sodium Benzoate, Sodium Hylauonate, Tocopherol, Cananga Odorata (Ylang Ylang) Flower Oil, Butylene Glycol (and) Salmon Egg Extract.